Former Treasury Secretary Lawrence Summers announced today that he was officially changing his nickname from “Tactfully Challenged” to “Gloomy Gus”. 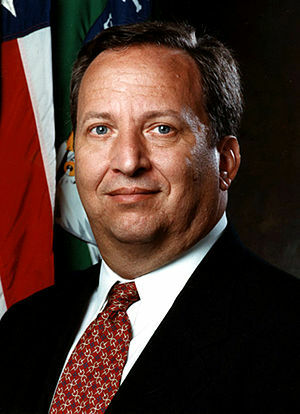 In April of 2004, we … were successful in meeting with President Summers. His manner was not inconsistent with his reputation and present day admissions of being tactfully challenged. It was not his failure to shake hands with the three of us upon entering his office (doing so would have required him to take his feet off his desk and stand up from his chair), nor his tenor that was most alarming, but rather his scorn for a genuine discourse on deeper ethical questions, Harvard’s Honor Code, and its applicability or lack thereof. In other Summers’ news, it was recently announced that he will join the Board of Directors for Square, a silicon-valley mobile payment technology start-up company. Square has purportedly launched a capital-raising effort that would place the company’s valuation at $1 billion or more. The Summers’ appointment comes at a time when technology start-ups are attempting to solidify their political connections. Summers’ friends on Capitol Hill and in the White House will potentially be of huge benefit to Square. Dreadmonger attempted unsuccessfully today to reach Summers for a comment at his suburban home in the tony Ashcroft section of Boston. Our reporters received no response at the Summers’ residence, but as they were leaving, they could see someone who looked like Summers lounging in a hammock in the backyard, apparently enjoying a cold beer. This entry was posted on August 4, 2011, 1:23 pm and is filed under Communications, Technology. You can follow any responses to this entry through RSS 2.0. You can leave a response, or trackback from your own site.